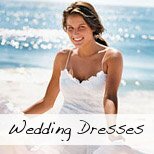 On this page you will find a wealth of fun beach wedding ideas to make your special day unique. 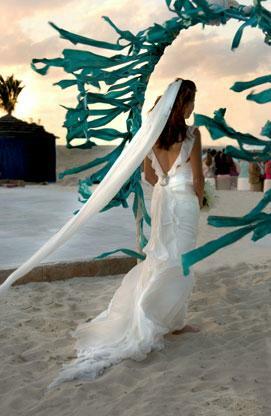 There are ideas here to enhance every aspect of your beach wedding from the ceremony to the reception. As the cliche states: "It's all in the details!" This page will be updated regularly as I come across more and more inspirational ideas. To stay current with any additions or updates please subscribe to my RSS feed (click on the orange button under the navigation bar on the left for more information). You can also check out my Pinterest Boards for more inspiring ideas on everything from hairstyle tips to DIY. 1. After the ceremony, during cocktail hour or during the reception (or all three! 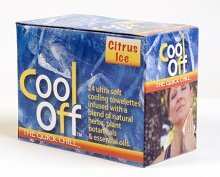 ), have a weathered row boat off to the side filled with ice and drinks as a neat self-service bar! This is really unique and will also save you some pennies as you don't need a bartender. 2. Provide a few small bottles of cold mineral water in a large basket (or a small boat - see above) near the "entrance" to the ceremony to refresh your guests before your ceremony. 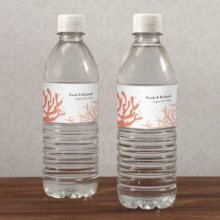 You can even have some Personalized Water Bottle Labels like in this picture! 3. 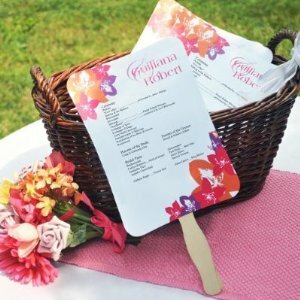 You can also try and incorporate fans into your ceremony (perhaps print your program on them) for guest to cool themselves during the service. Try this DIY Designer Fan Program Kit. It is really great for those of you who are good at crafts and have some time to do a few things yourselves. It includes a CD with blank and ready-made templates so you can design your own and personalize them! 4. Keep the younger guests (and probably some of the guys) entertained while you are having your pictures taken by providing them with beautiful kites to play with. Have them made specially in your wedding colors or even monogrammed! This Starflake Kite is really special, and will also look really nice as a prop for you and your new spouse when you take your photos! 5. 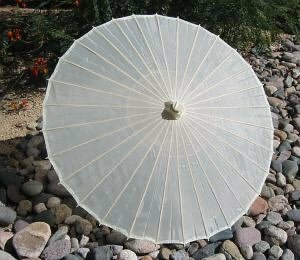 Provide all your female guests with pretty oriental Parasols to shelter them from the sun. And how about a special White Lace Parasol for the bride! They are not only functional (shading your guests from the summer sun, they are also really lovely on photographs and can be used as wedding favors too. 6. For any outdoor wedding, and especially a beach wedding, the sun will most probably be scorching. And I can bet a lot of people will not be prepared for the beach (even if they know they are going to the beach, they still think "wedding"). Provide those who forgot to put on sunscreen with some Sunscreen Towelettes, maybe some caps, hats and the parasols already mentioned above. 7. 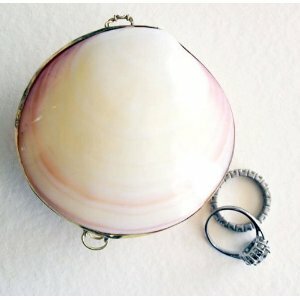 Instead of a ring pillow, present your rings in large shells or in something like this Sea Shell Box. You can use a large shell like a Nautilus shell. Fill the shell with some moss or cotton wool or even a soft fabric like organza. This will stop the rings from falling inside the shell and possibly getting stuck there! 8. Line your isle with fun Paper Pinwheels. 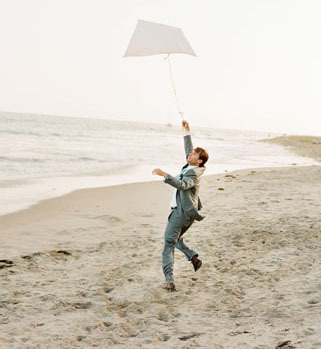 The will twirl in the wind and will be great for any of the kids to play with afterwards. Another simple DIY Beach Wedding Idea! 9. Take this tip from Rob and Amber's wedding that was put together by Colin Cowie - "We put a ribbon in each guest's hotel room before the wedding and asked them to take a few moments to think of their wish for Rob and Amber and write it on the ribbon. Then everyone brought the ribbon to the ceremony and we placed them all under a Wedding Arch, so when Rob and Amber came down the aisle they walked through the collective wishes of their friends and family. It was fabulous." 10. 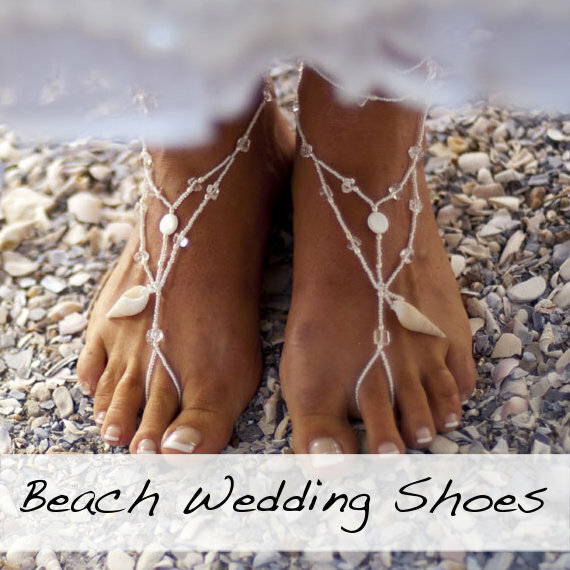 If only your ceremony will take place on the beach then provide a place for your guests to wash their feet in before putting on their own shoes again. It is convenient if you have a tap somewhere on the beach. If not, have a large basin, a few jugs of water with some rose petals or other flowers and some Small Towels for drying. 11. 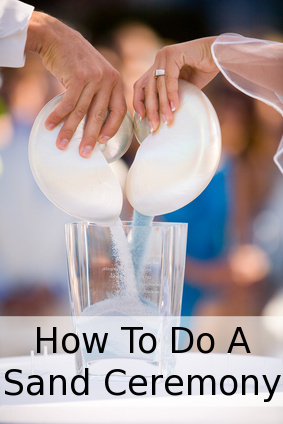 Instead of having a regular unity candle ceremony (could be tricky in the sea breeze), why not have a sand ceremony? This is also a very touching little ceremony that leaves you with a very nice keepsake of your wedding ceremony as the layered sand can be sealed in an engraved vase. It can also be modified to include both sets of parents as well as any children you or your fiance might have. 12. And if your reception will run into the evening you can incorporate some Sky/Wish Lanterns. You can set them off at any time that might seem appropriate to you... just before the first dance comes to my mind - that way you will be opening your dance floor as all the lanterns float to the sky... They are breathtaking, safe and biodegradable. 13. Bring many of the above beach wedding ideas together while making your guests feel super welcome with a little goodie bag! You can either leave this in their hotel rooms (if it is a destination wedding), or hand it out to them just before the ceremony starts. 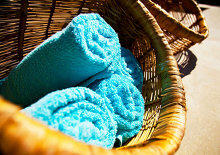 You can include some flip flops, a small hand towel (for drying their feet after washing), sunscreen towelettes, caps, water bottle, fan program, parasols and cooling, refreshing scented towelettes. 14. Another little thing to add to your goodie bag or to have on display at the ceremony as favors - sunglasses! You can buy bulk sunglasses for quite a good price and putting this little sign there is just so cute! Heart shaped ones would also make super cute photos. 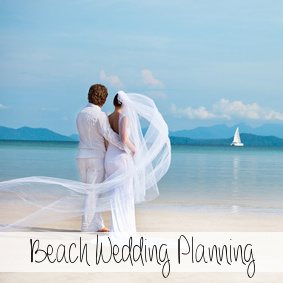 Want Some More Beach Wedding Ideas? 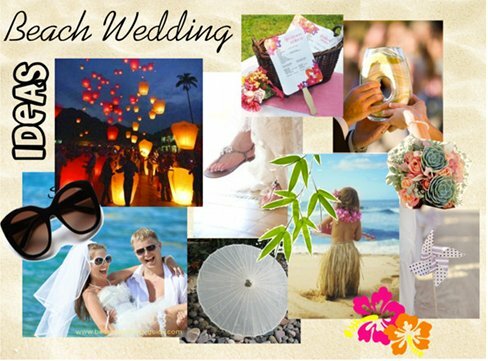 More beach wedding ideas and planning tips. 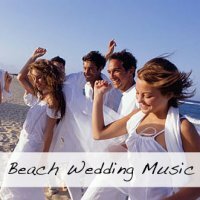 Great ideas for beach wedding music for your ceremony and reception. Looking for that perfect pair of pretty flip-flops or barefoot sandals, or perhaps another alternative? Check out our suggestions HERE.